Over the past couple of weeks my 6th graders have spent time reading and discussing John Boyne's The Boy in the Striped Pajamas. It's a story of two young boys who meet each other, by happenstance, at a fence and over time, befriend each other. They come to share and enjoy each other's company over the course of a year even-though the fence keeps them apart. Despite the boy's shared birthdays they are not only separated by a physical barrier, but by the social lottery as well. Bruno, is the naive son of a German officer in charge of a Nazi concentration camp; Shmuel, a Jewish prisoner in the camp who is described by Bruno's father in the movie of the same name as "not really people at all." The fence prohibits physical contact, except to pass the food that Bruno smuggles to his unlikely friend. 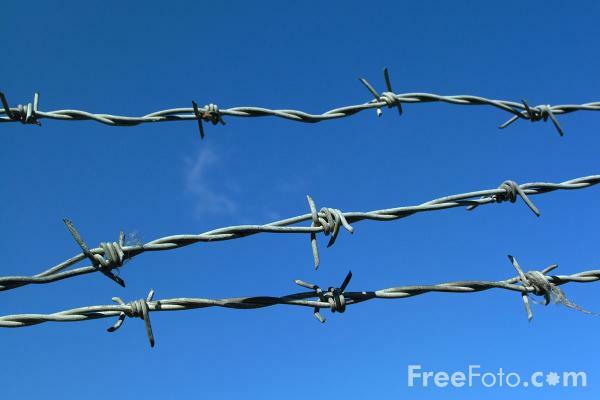 The fence's forced separation is both literal and symbolic for the characters. Shmuel knows very well the limitations that his circumstances prescribe, while Bruno's naivete' and innocence prevent his full understanding of the barrier that separates the boys. In the closing section of the book, Shmuel lifts the fence, while Bruno scampers underneath so the boys can go on an adventure in search of Shmuel's missing 'Papa'. The book and movie are remarkable for a number of reasons and Boyne is a gifted story teller that allows the reader to make meaning from the text without explicitly stating it for the reader. I highly recommend the book and the movie to both adults and upper elementary or middle school aged students; used in combination they make a powerful lasting impact. On Friday, the 6th grade watched the movie together and aside from the power that this shared experience brought, I was struck by the silence at the conclusion of the movie as the credits began to roll. I quietly asked my room to line up and follow me out of our school's "Little Theater". We took a right turn instead of the normal left as I split the class into two groups. I handed my school keys to trustworthy Nate and quickly gave him instructions on how to get back into the building and sent his group outside to meet us at the far corner of our playground. When I walked outside with my group, the weather conditions had changed dramatically for the worse from the morning's warm and pleasant conditions. The wind was howling, the sun had disappeared, water spit from the sky, and the temperature had fallen 17 degrees in the two hours since we started watching the movie. Actually perfect. As the group I was leading approached the group standing on the other side of the fence, my remarkable group of 12 year old kids had already started to make the connection that I was going to try to make. They faced each other through the moistening grey steel weave and looked at a classmate who at the same time is very different and very much the same as they are. Our playground fence didn't separate atrocity and innocence as in the story that just moistened our eyes just minutes before, but it still divided us. I asked the kids to consider the metaphorical fences that they will encounter during their lives. The fence of ignorance that prevents inclusion, empathy and compassion of others. The fences of fear that prevents the undertaking of something difficult that could result in failure. Fences of misconceptions and judgement that prevent us from our potential in making a positive impact on those in our circle of influence. I told my kids that the person across from you did not have a choice as to where they ended up. They could have just as easily ended up protected and safe, instead of exposed and on the outside. 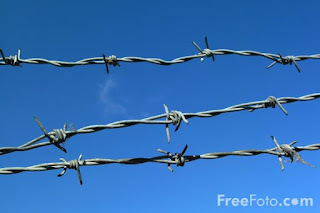 I asked them to try and remove the fences in their life that will keep themselves and others from being happy. Even if we can't find a way to tear down a fence, at least try to find a way to lift it just a little so that love, friendship, and happiness can pass through. Eric, thank you for sharing this. I was unfamiliar with this story until just recently watching the movie because Netflix recommended it to me. Having taught 6th grade, I'm not sure I would have been brave enough to watch the movie with my students. I am glad you were, and that you were able to cap off an already moving experience with your fence object lesson. There is a very great chance that your students will take the learning from this story to heart! Thank you. Sometimes when I take risks, I crash and burn, but sometimes they pay off, as it did here. I look for opportunities throughout the school year to create positive life experiences for my kids, because I know so many of them don't get those at home. This was one of those occasions. Thank you for sharing this. As one of your congregation members, it's good to see your thoughts on this. As stated above, keep the faith, but also, run the distance. fencing adelaide. I love this idea! Were all of your parents/principal ok with showing a PG-13 movie in class? I'd love to try this but am not sure that the PG-13 movie would go over very well, but I think the kids would learn a lot from it. Thanks! I'm not a big fan of showing movies, but in this case it fit the standards very well and was the culmination of a reading/writing unit. Yes, our principal was on board and we worked with her on drafting a permission slip for our home partners. In the two years we've done this unit, we have never had a family opt out. (150+ kids) Parents were welcome to attend as well.